Cee-Lay is one of the Turlock hens you met in the TURLOCK documentary! Of the 4,460 hens rescued, Animal Place took in 4,100 at our Rescue Ranch facility. And of those, around a 100 became permanent residents at our 600-acre sanctuary. Cee-Lay is one of them. Cee-Lay has been severely de-beaked, but that doesn't stop her from enjoying life. She and many of the other Turlock hens like to stay up late at night, making life difficult for animal caregivers. They often have to be picked up and carried into the barn! Like Cee-Lay, Rosemary is one of the 4,100 hens rescued by Animal Place from A&L Poultry in Turlock, California. Rosemary is a white leghorn, the most common breed used for egg production. She loves dust-bathing in the red-clay dirt. Dust-bathes help keep away parasites and feels good. Rosemary really loves it when other hens come over and dust-bathe with her. Copper was confiscated by an animal control agency from a small egg farm. The farmer had stopped feeding the birds, leaving many malnourished. Copper arrived covered in parasites. It would take weeks for her and the other hens to recover physically from their trauma. Copper passed away in 2012, but during her life she loved hanging out with Arturo and Newman, two roosters. She could be a little pushy on the perches, especially in the evening. Copper was only five when she passed away. Reproductive disease and cancer is common among breeds used for egg production. Nancy was bought as a chick from a feedstore or hatchery. The people who bought her determined egg production was the only valuable contribution Nancy could make to this world. And when that egg production declined, they tethered her to a chain-link fence and left her there to die. Luckily, a passer-by saw what happened and saved the petrified, entangled hen. Before Nancy passed away from egg-related health problems, she enjoyed sun-bathing and dust-bathes with her hen friends. Big Ray is a big rooster with a sweet disposition and sensitive soul! He is a victim of the backyard chicken movement. Many hatcheries sell day-old rooster chicks as "packing peanuts" to keep hen chicks warm. 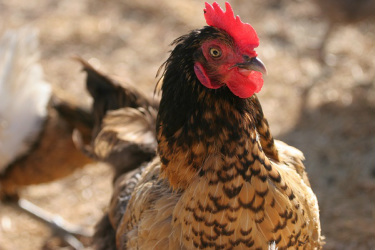 Since roosters are often illegal in areas permitting urban chickens, roosters are often abandoned on the street, at shelters, or in Ray's case a feedstore. He would have been given away for free, most likely to someone who who would have slaughtered him. A chicken lover couldn't bear the thought, rescued Ray, rehabilitated him, and now he is safe at sanctuary.